In a Robin plus size dress, you dress yourself trendy and fashionable. Make sure that you are wearing the right size gown. If you wear a too large prom dress, it may seem that you're trying to camouflage your figure. Do not try to hide yourself but go for a nice affiliated evening dress that accentuates your figure in a nice way and show your beautiful feminine curves. The prom dresses plus sizes ranging from size 42 up to 52, with occasionally a large size 54. Prom dresses in large sizes with lace bodice and chiffon skirt in mauve. Cheerful plus size prom dress featured a floral print in the white red pink. 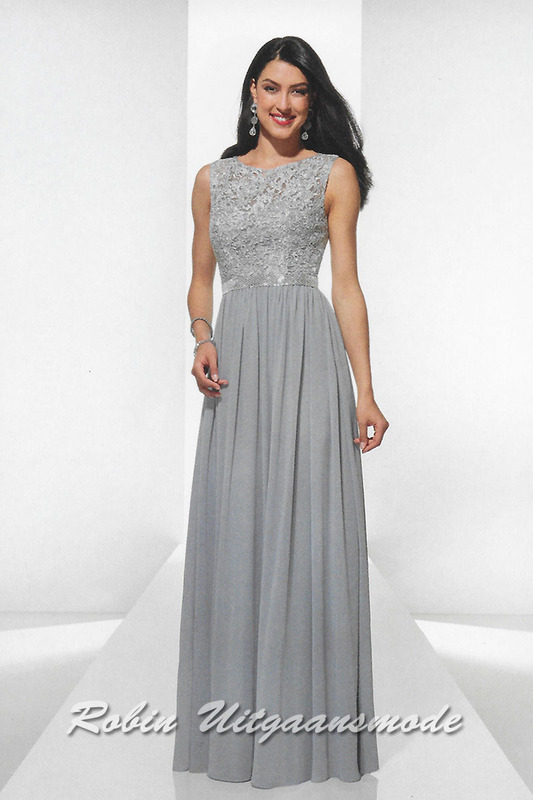 Elegant grey evening dress features a overlay embroidered lace bodice with high neck line, up size 48. High-neckline prom dress with a heart-shaped bodice, the lace fabric has embroidery and beading accents, up to size 50. Chic plus size prom dress with cap sleeves and beaded bodice, available in four colours, up to size 50. Silver coloured evening dresses with embroidered lace bodice and elegant waist band, up to size 48. 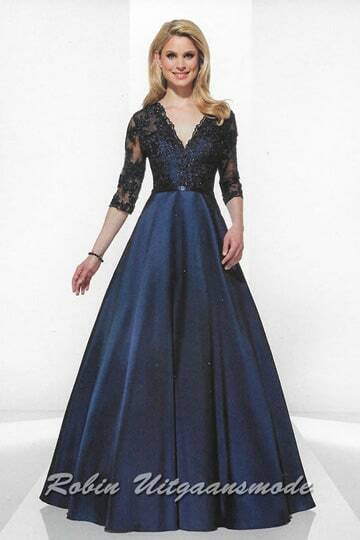 Dark blue evening dress with half-length sleeves. The V-neck bodice is decorated with lace fabric and beads. Size 38 - 50. 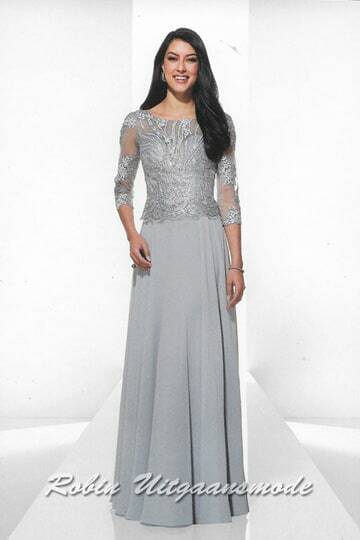 Elegant evening dress in a silver colour with a lace overlay bodice, high neck and a long lace sleeve. Stunning prom dress features a lovely embroidered lace bodice and wide Tule skirt, up to size 48. Plus size dress with a V-neck halter and flary skirt, available in red, wine and navy. Navy blue dress with elegant wrap style bodice and delicately beaded lace cap sleeves, up to size 48. Luxurious prom dress features a beaded buster, draped waistline and small cap sleeves. 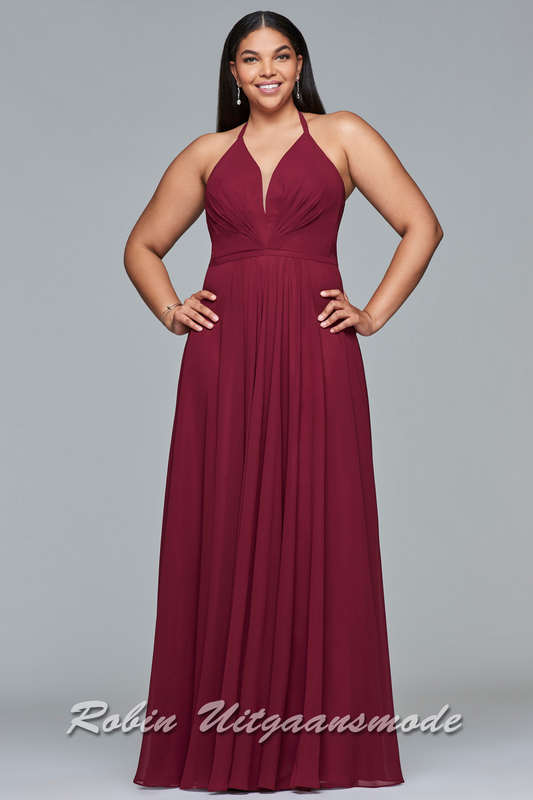 Bordeaux red plus size prom dresses with embroidered bodice and lace-up back. Red long prom dresses with draped front, V-neck and a high slit in size 50. Stylish blue gown with flared skirt and beaded bodice, up to size 42. Dazzling sequin dress in a plus size 46 blue with sweetheart neckline and illusion shoulder straps. Beautifully prom dress features appliques on the top, and a v-neck with an illusion insert. Green strapless evening dress with sweetheart bodice, a front high slit, up to size 52. Stylish strapless prom dress with beaded small stones, available petrol and Bordeaux red up to size 50. Stylish blue evening dress features a strapless bodice, A-line skirt with tule and short bolero jacket in size 44. Two-tone strapless evening dress with a wide flared skirt in burgundy and white in size 44. Elegant evening dress with embroidered buster, draped waist and skirt, only available in ivory up to size 48. Sweetheart strapless prom dress with ruched patterned bodice and a straight-cut back, up to size 52. Stylish plus size dress with embroidered bodice, illusion high neck and flowy skirt, available in blue size 46. You can choice for a standard flared black dress or shine at the party in a coloured evening gown. Wearing a fully print prom dress you'll get even better. In our collection you find beautiful dresses for the larger sizes, which ensure a nice waist accent and a feminine look. The evening dresses are made of solid fabric Taft which is often used for the changeant effect, a reflection effect, which gives a rich and lively look. The waist is accentuated with these evening dresses. The chiffon dresses are nice supple thin fabric. These prom dresses fall flary along the body and through the right cut they also look very nice. If you are looking for a beautiful dress and you have a large size, feel free to visit us. The Robin store is located in the centre of Amsterdam near the Rembrandtplein.